As I mentioned in yesterday's post, my recent trip allowed me to check off two national parks from my bucket list. This is an image from the second park that we visited - Crater Lake National Park. It is an amazing place to visit and I wish I was able to fit it in during the golden hours. Due to our travel schedule and it's remoteness, we were only able to get there in mid-morning. Even then, the visit was well worth it. 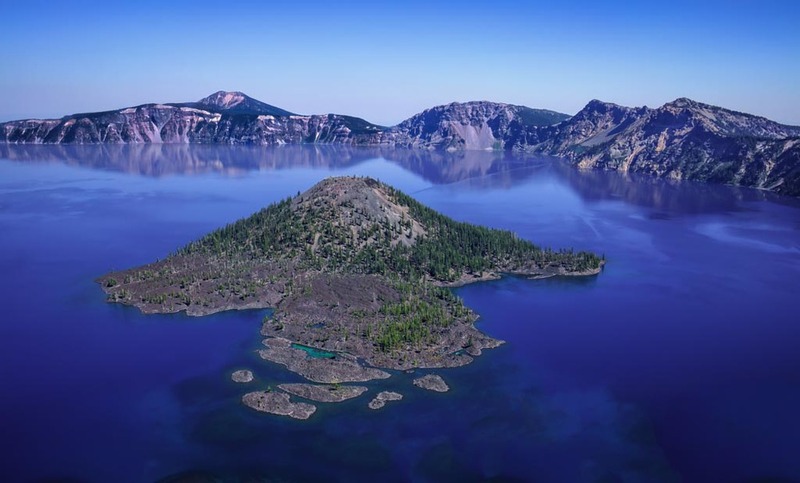 The lake and the island were created almost 7,700 years ago when a volcano (Mount Mazama) erupted and left a 4,000 foot hole where the mountain once stood. Wizard Island was formed over the next few hundred years as a result of numerous smaller eruptions that formed large cinder cones on the bottom. Wizard Island is actually the top of the tallest cone that rises over 2,700 feet. Once the crater's walls solidified, water from the surrounding mountains' melting snow slowly filled the crater (it is estimated to have taken 720 years to reach its current level). Since Crater Lake (the lake) has no inlets or tributaries, the waters of Crater Lake are some of the purest and bluest in the world.